Two of Studio Ghibli's most celebated films, Hayao Miyazaki's Kiki's Delivery Service and Isao Takahata's gut-wrenching Grave of the Fireflies, are to make their UK Blu-ray debut in July as double-play editions (containing both Blu-ray and DVD) from Studiocanal. Both discs will be rich with extra features, some of them new to this release. It’s witch meets world, as teenage Kiki chooses to live on her own in a new town, using her magical powers to get by. But Kiki is poor with potions and second-rate at spells- instead, she sets up a courier service, using her broomstick to deliver everything from pies to pets. At first with only her sarcastic cat Jiji for company, she soon discovers that she has more friends than she ever thought possible. 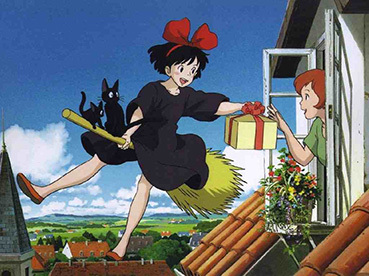 Adapted by Hayao Miyazaki from the children’s book by Eiko Kadono, Kiki's Delivery Service is one of the best-loved animated features in Japan and elsewhere. 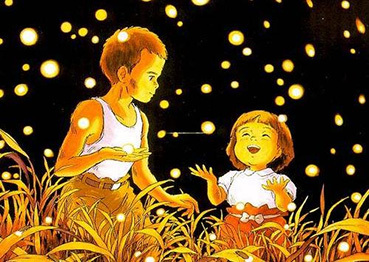 Set in Japan during World War II, the film focuses on Seita and his little sister Setsuko. After their mother is killed in an air raid and with their father serving in the navy, they are forced to fight for survival in the devastated Japanese countryside. Food and shelter are scarce, and even their own relatives are too concerned with their own survival. Allthey have is each other and their belief that life must carry on. Takahata and his team, including character animator Yoshifumi Kondo (who has subsequently worked on other acclaimed Ghibli films from director Hayao Miyazaki) have created a visually stunning and emotionally powerful film and that meditates on the devastating consequences of war and has rightly earned a reputation as an anime classic. Both discs will be released on 1st July 2013 by Studiocanal at the RRP of £24.99 apiece.